Mayor Bill de Blasio and Schools Chancellor Richard A. Carranza announced on Monday that the city will be rolling out 47 new Pre-K dual language programs in schools across the five boroughs this fall. The new programs, which will bring the city total up to 107, will include the city’s first French, Haitian-Creole, Hebrew and Japanese language programs. Both Queens and Brooklyn will each see 16 new dual language programs, with six in the Bronx, eight in Manhattan, and one on Staten Island at the start of the 2019-2020 school year. With four sites offering more than one language, the programs will span 103 schools, Pre-K centers, and New York City Early Education Centers throughout the boroughs. In addition to the new languages, existing programs will continue to offer students the opportunity to study in Bengali, Chinese, Italian, Russian and Spanish. Queens, which previously only had programs for Spanish and Bengali, has added three Chinese programs, including one at Kon Wah Day School in Flushing. 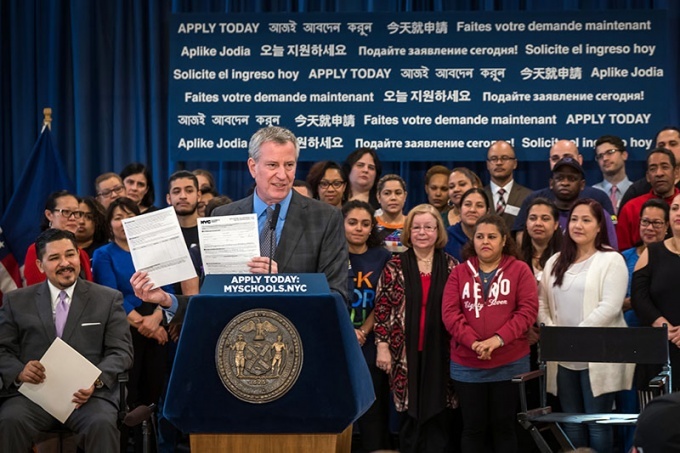 Spanish language programs will be added to several schools in the Jackson Heights, Elmhurst and Corona neighborhoods, including BWY Preschool, PS 19 Marino Jeantet, PS 127 Aerospace Science Magnet School, Sesame Sprout, Atonement Preschool and Corona Friends. Little Friends School in Sunnyside and the Long Island City YMCA will also offer Spanish programs. The Dual Language classrooms are typically filled with a 50:50 split of students whose home language is the language being taught and students who are English-proficient. Teachers then instruct in both languages. Instruction is held in both languages, and students in Pre-K Dual Language classes may continue on the Dual Language track in Kindergarten and beyond. Students who are enrolled in the Pre-K Dual Language program will then have the opportunity to continue on in one of the 545 bilingual programs across the city for grades K-12 teaching 13 different languages. Dual language programs have seen immense growth in recent years, with approximately 200 programs opening or expanding since the 2013-2014. Roughly 40,000 students are already enrolled in these programs. Applications for the free, full-day programs opened on Monday. Families can view available early childhood programs and apply online at MySchools.nyc, over the phone at 718-935-2009, or in person at a Family Welcome Center.